If you want to win with Black, you must decide which is the best strategy to achieve your aim. Should you take risks and go for the win right from move one, or should you patiently set about achieving equality and then wait for mistakes by White? Which opening should you choose and what is the role played by opening preparation? What can you do when you even have to win with Black, because, e.g., a match can only be saved by a win with Black in the very last game a situation which has become all the more familiar because of the ever-rising number of knock-out tournaments. 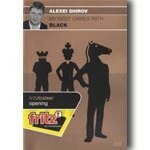 Alexei Shirov tries to answer these questions by referring to his own games as Black. In doing so, he describes how his own attitude to this problem has changed over his career, right up to his successes in the 2007 World Cup in Khanty-Mansiysk, in which he reached the final. Video running time: 6 h 45 m.
Alexei Shirov was born in Riga just like world champion Mihail Tal, and also his playing style reminds many chess fans of the young Tal. In the beginning of the 90s, a comet-like rise brought the young Latvian to the world top within the shortest of time. Being no older than 22 years, he already had an Elo rating of nearly 2750 and belonged to the absolute elite. Since then Shirov has been one of the best players in the world, delighting all chess fans with original and amazing ideas on the board.